More than a month earlier, my wife had signed up to take a reffing gig in Napa County with the idea that we drive up together, do a little hiking and maybe spend the night. Then the effects of 7yrs drought, oak sudden death syndrome, hot and windy weather, and apparently some poorly-maintained PG&E powerlines conspired to set the county ablaze, burning in 4 large areas for almost three weeks. Up until a few days before, it was expected that the match would be cancelled, but calm wind and a little rain helped the firefighters get the fires contained. Our visit would be an abbreviated version of what we had envisioned, but it was still nice. We had gotten lunch at Gott's Station in St. Helena, thinking we'd picnic in nearby Bothe-Napa Valley State Park before doing a short hike to Coyote Peak inside the park. That got squashed when we found the park closed. There was no fire within miles of the park, so not exactly sure why, but the employee we talked to there said they expected to re-open in a few days. The backup plan was a visit to Las Posadas State Forest just above Angwin where my wife was to ref volleyball at Pacific Union College. I still haven't figured out what they do at experimental forests, but one can imagine military/industrial scientists creating genetically modified trees to be used as biological weapons in some future conflict. An online search turned up various stories about the forest, from 'absolutely no trespassing', to 'hidden gem.' The truth seems to lie in-between. At the northeast corner of the forest where Las Posadas Road makes a 90 degree turn, there is parking for about 10 cars and the place appears popular. To the left is property owned by the college which welcomes visitors on foot, bike or equestrian. To the right is the Las Posadas forest with a sign that indeeds states, No Trespassing. This seems to be completely ignored and perhaps no longer valid. Trails go off in both directions through college and state forest property alike. With only about 30min before my wife had to be at the college, she stayed in the car for a short nap while I headed off onto the college property in search of Howell Mountain, about a mile to the north. The trails and trail junctions are all completely unmarked (in the state forest, too), but they are wide and easy to follow if you know where you're going. All the land around here is either vineyard, ranchland or forest and the college property seems a collection of all three. There are various gates to restrict cattle movements but allow visitors access to many acres of land around the college. 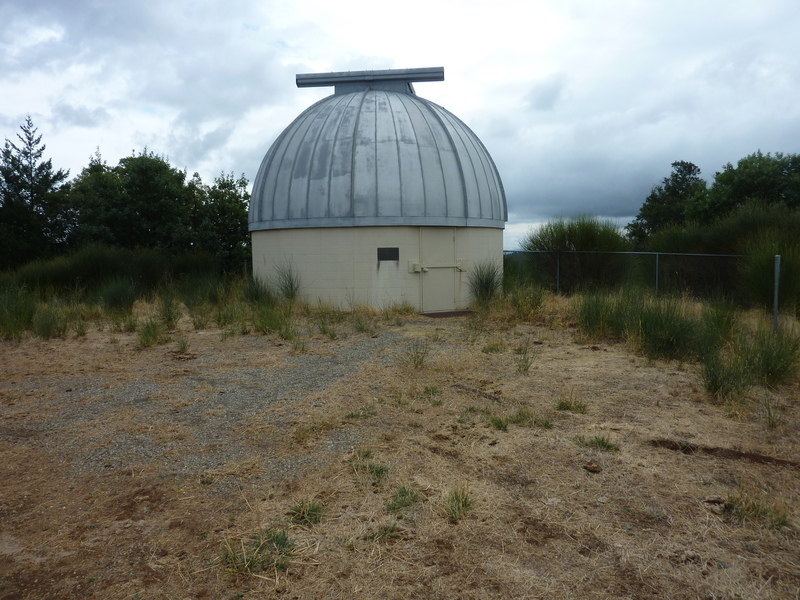 At the top of Howell Mtn I found an old observatory, locked and looking to see little use. The views from the top are marginal, but to the north is an adjacent ranch with cattle grazing peacefully under cloudy skies. I jogged back at a casual pace to make sure we'd get my wife to her match on time. Bob, on my way up Moore Creek from Lake Hennessey in Moore Creek Park, on my way to Peak 1920 this February ( see http://www.peakbagger.com/climber/ascent.aspx?aid=769986 ) I met three mountain bikers who had come down the trail following the creek all the way from Las Posadas and they said it was a fine route. There was high water on Moore Creek though and they had had some hairy stream crossings.